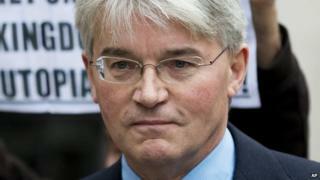 Image caption Andrew Mitchell denies using the word "pleb"
The police officer at the centre of the "plebgate" row has accepted £80,000 in damages from Conservative MP Andrew Mitchell. A judge ruled last year the MP probably had called PC Toby Rowland, an officer on duty at Downing Street's gates, a "pleb". Mr Mitchell accepted using bad language but said he had not used that word. The ex-chief whip has already paid £300,000 in legal costs to the Sun newspaper and the Police Federation. He lost a high-profile action against News Group Newspapers, publishers of the Sun, in November. A judge said he had reached the "firm conclusion" that Mr Mitchell had used the "politically toxic" word "pleb" in September 2012 when he was not allowed to cycle through the main Downing Street vehicle gates. PC Rowland's lawyer, Jeremy Clarke-Williams, told Mr Justice Warby that since that judgement Mr Mitchell "has abandoned the other defences he had raised to my client's claim and consequently terms of settlement have been agreed". The solicitor added: "The payment of £80,000 damages by Mr Mitchell sets the seal on PC Rowland's vindication, as well as providing compensation for the injury to his reputation and the distress caused to him and his family over many months. "PC Rowland never felt that the events in Downing Street were anything more than a minor incident. "He was not responsible for the publicity which followed and would have much preferred that the whole matter had never entered the public domain. "He now simply wishes to be left in peace to continue his police career." Neither Mr Mitchell nor PC Rowland was in court. The row centres on a 15-second confrontation between Mr Mitchell and PC Rowland, after the then cabinet minister was refused permission to cycle through the main gates at Downing Street. The story was splashed across the front page of The Sun, which said the chief whip swore at the officers and called them "plebs" who should learn their place. Mr Mitchell admitted swearing but denied using the word "pleb". He was forced to resign from the cabinet but vowed to clear his name in the libel courts, launching an action against The Sun. PC Rowland then launched a libel action against Mr Mitchell, claiming that his reputation has been damaged by the MP's remarks and that he suffered "great distress, humiliation and upset". In November 2014, Mr Justice Mitting ruled that Mitchell probably did call police officers "plebs"
He added that gaps and inconsistencies in PC Rowland's account did not demonstrate he had fabricated his account, as Mr Mitchell's lawyers claimed. The judge ordered Mr Mitchell to pay interim costs of £300,000 but the total legal bill he will face is not yet known. A Scotland Yard diplomatic protection officer has been jailed for 12 months after admitting lying about the "plebgate" incident. Keith Wallis falsely claimed in an email to his MP, the Conservative deputy chief whip John Randall, that he had witnessed the confrontation. Wallis and three other members of the Metropolitan Police's elite diplomatic protection squad have been sacked for gross misconduct in relation to the "plebgate" incident and its subsequent leaking to the press. Separately, the Independent Police Complaints Commission, has launched an investigation into three officers - one each from from the Warwickshire, West Mercia and West Midlands forces - over an account they gave of a meeting with Mr Mitchell at the height of the affair.